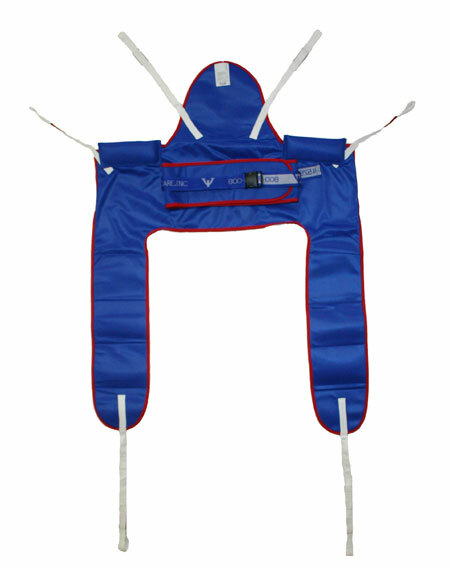 The hygiene sling is used for toileting. It features a torso support belt and back support section. Hygiene slings are available in your choice of “standard” cloth polyester, “H” cloth, which is high-heat polyester that withstands temperatures up to 200°. “Mesh” a polyester material (for bathing). You may also choose “C” cloth a cool-heat polyester that withstands temperatures up to 167° and has a non-absorbent coating on one side for easy spot cleaning. All slings and belts are also available in a disposable material to help with infection control and cross contamination issues. There are many different custom options available. Please contact Vancare or a local distributor to discuss your concerns and options.